With the Sentry trip amplifier, we have responded to frequent requests from our customers to fill the gap in our transmitter and signal conditioner range. Industrial automation and control instrumentation specialists Define Instruments today announces the launch of its new product: the Sentry trip amplifier. 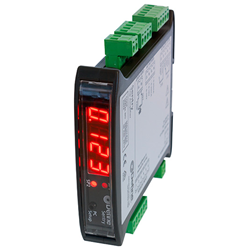 The Sentry is a compact, DIN rail mountable signal conditioner measuring just 0.91" wide. Described as the “Swiss Army knife” of trip amplifiers, its primary use is in industrial monitoring and alarming applications. The Sentry "watches over" scenarios where monitoring is vital (e.g. monitoring the temperature of cold storage for foodstuffs), and alarms when signals exceed safe parameters. Define Instruments Inc Business Development Manager, Rolla Afrogheh, says: "I'm excited to announce the release of the Sentry as there's been frequent requests from customers for us to fill one of the last gaps in our transmitter and signal conditioner range. This product is a response to this." The Sentry accepts 7 signal input types (Potentiometer, V, Tc, mA, Freq, NTC and RTD) and works with both AC or DC voltage (24-250V AC or 19.5-250V DC). This provides in-field flexibility as it can be plugged in to whatever power source is available and eliminates the risk of the unit being accidentally blown up by use of an incorrect power supply. It has 2 relay outputs for alarm or control applications and an optional isolated analogue output, which converts signals to 0-10V or 4-20mA for forwarding to a PLC or SCADA systems. A unique and distinguishing feature of the Sentry is its 4-digit display, a big advantage for easy commissioning and fault finding. Additionally, the Sentry supplies the excitation required for common sensors and transmitters. Configuration takes just 60 seconds using Define’s complimentary ToolBox software. The ToolBox software includes wiring diagrams and application examples to assist the less technically knowledgeable to program the unit with the minimum of hassle. Define Instruments manufactures electronic instruments for industrial process automation, measurement and control. With over 26 years of innovation and industry expertise, Define’s products are routinely used for applications in industries such as: Oil & Gas, Food Production, Pharma and Agriculture. Its key products: the Merlin and the Javelin are UL certified and Define Instruments is ISO9001:2008 International Quality Standard accredited.